for "improved" STREET performance. 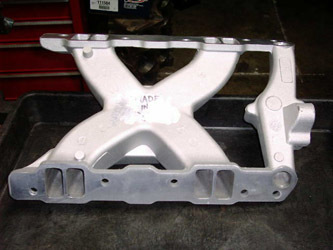 Its main design feature was to fit under the shaker assembly of a Trans Am. or track reporting of claimed "performance gains" before the item hit the shelves. 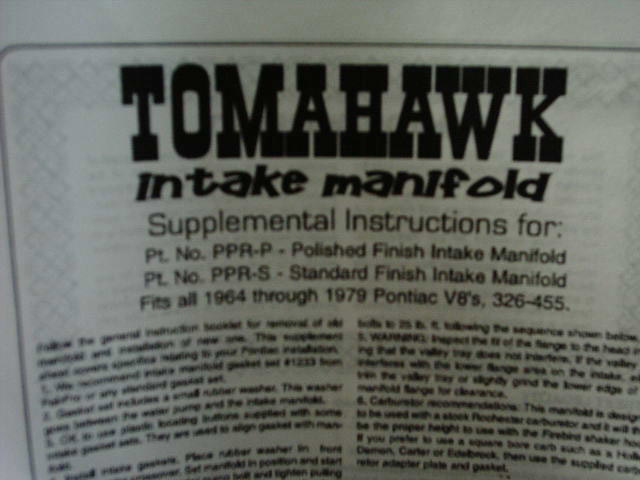 use of this purpose built intake, as it was touted as "fitting under the hood of a Trans Am shaker assembly"!!!!!!!." So everyone has been waiting for real world professional results, which we have the first known here. The only verified report is from a 400 inch Super Stock race engine. engine tuner Phillip Montieth. In back to back tests Phil compared his early style Torker that he uses on his S/S'r (not the Torker II) to the new intake. 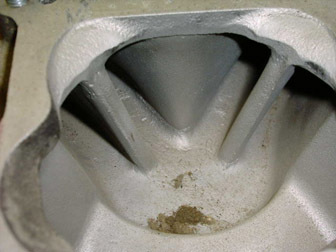 The new intake lost over a tenth of a second - verified. Lost MPH too. "This is NOT a race intake." 600 lbs. 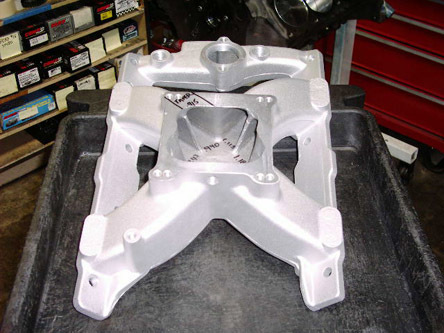 ft. @ 4000 rpm - why build an intake that has less velocity for street RPM's? Some peoples ideals (lack of knowledge,) gets lost in their need for fame or cash. Pete, Jimmy, you readin' boys? We will be doing testing on one of these as time allows. After Phils at the track testing this weekend we're not in a hurry. If there's anything good about it I'll certainly report just that too. I believe in reporting the truth. and wider and lower in the back. It was designed for spread bore style carbs like Q-jets. How well? - In my Super Stocker, to the tune of 136 mph so far. If you want a good single plane Q-jet intake hit the swap meet. Here's an untouched stock Torker. What we now call the "Torker 1." Predecessor to the Torker II. The Torker II was designed for square port carbs like Demons/Holleys. 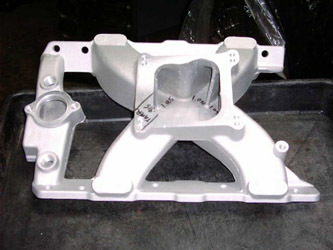 Although either intake can accept either style, they are design specific. its larger than the Chinese radius. My book will delve into the importance of the large radius port divider. If any of you have knife edged your port dividers, maybe you can sell it on Ebay before someone reads this. The new Chinese intake has different width runners on ALL EIGHT runners. Why? I had wondered if science had passed me by, and maybe there was something new to learn. but, no. It's just all screwed up. Even the untrained eye can see the difference of runner widths in this picture below. for a proper size radius even after blending. But blend it the best you can if you run one of these. Look at the radii on the Torker 1 port dividers. Below is a shot of all eight runner openings and their widths at the opening. All were measured in the same area. Some runners have tapered openings. Some don't. Overall? Inexcusably inconsistent. 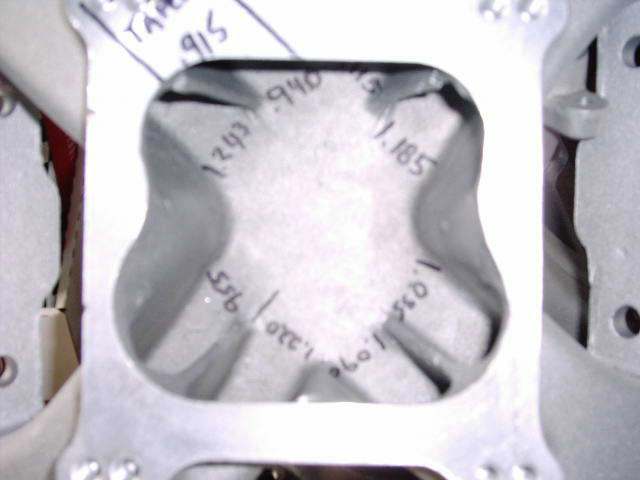 A single 4 bbl intake MUST have properly sized radiused port dividers. These Chinese runner dividers are not made with any visible science. They're too thin for proper fluid adhesion, instead, causing a shear condition. "Trust me, the Chinese will get it right on the next batch." (???) So what? What about the unsuspecting buyers who get one from the first batch ? Totally unacceptable - A lack of Quality Control on someones part. The inconsistent runner widths DO become equal by the time the runner reaches the head. 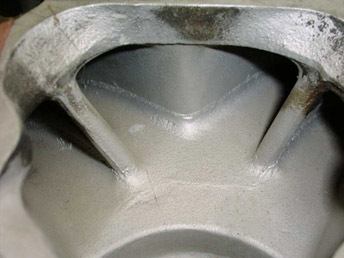 This intake could function as an "air only" intake for port injection. 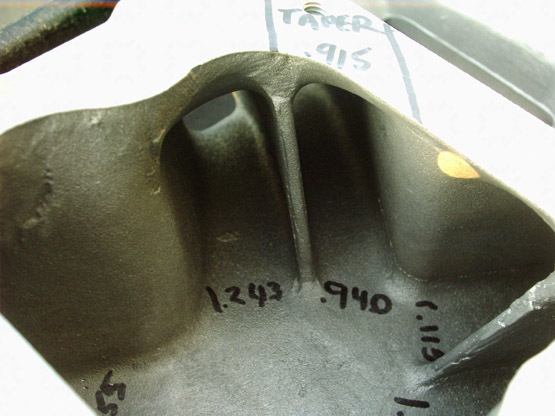 Although the inconsistent runner size and other casting flaws can easily cause turbulence, in turn, losing velocity. and there's not enough material to cover the rear of a '64 heads oil drain back passages. But the typo is something that can be easily fixed. >return the favor if your interested. >forged replacement pistons and a RAIV cam. >compared to the others I tested. >got straight from the DYNO.